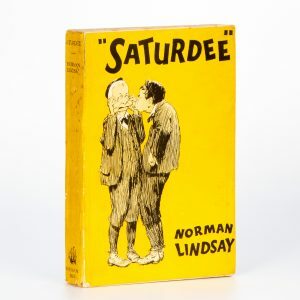 [LINDSAY, Norman]. BLOOMFIELD, Lin (ed.). 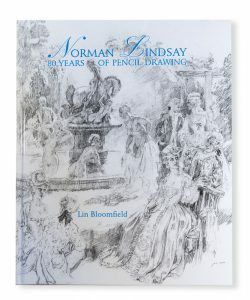 Norman Lindsay: 80 Years of Pencil Drawings. 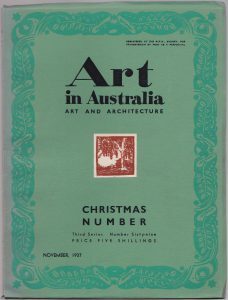 Sydney: Angus & Robertson, 1936. First edition. 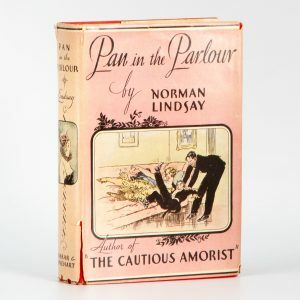 Large octavo, Lindsay decorated papered boards (bright), illustrated dust jacket (several edge tears), 120pp., very slight foxing to preliminaries, with numerous Lindsay illustrations. 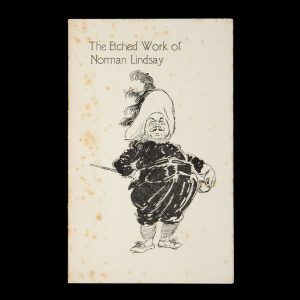 First edition of Lindsay’s second children’s book, the first being The Magic Pudding. A very good copy, rare in the jacket. 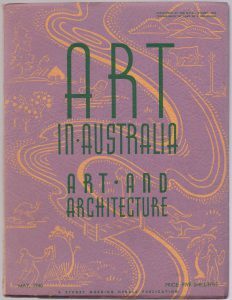 Sydney: Art in Australia, 1931. Quarto, illustrated wrappers (a couple of minor stains, tape repairs to spine), light foxing to preliminaries as usual. Contains 64 full page reproductions. Art in Australia. Art and Architecture. Third Series, Number Seventy-Four. Art in Australia. Art and Architecture. Third Series, Number Seventy-Nine. Creswick, Vic. : Cressaid Media, 1979. 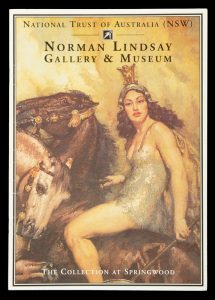 “Published for the Norman Lindsay Centenary Commemoration Committee and the Creswick Museum Trust” (p.2). Newspaper, folding to 9 pp, quarto, printed in sepia, illustrated, a fine copy. [Sydney] : National Trust, New South Wales, 1996. Revised edition. Quarto, pictorial stiff wrappers, 25 pp, illustrated in colour and black and whit; previous owner’s name to title page, but a very good copy. Sydney : The Endeavour Press, 1933. First edition. 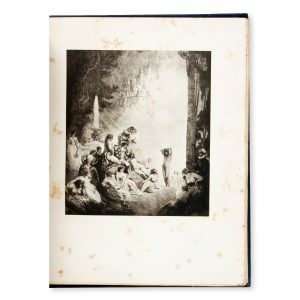 Octavo, illustrated cards with Norman Lindsay illustration, 259 pp (light foxing to fore edge), a fine copy of the wrappered issue of the first edition. 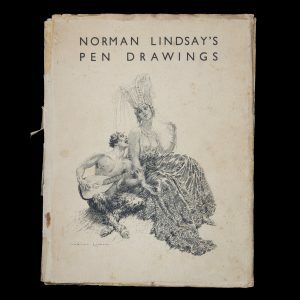 With eighteen illustrations by Norman Lindsay. 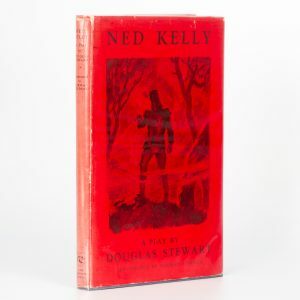 Sydney : The Shepherd Press, 1946. Octavo, cloth in dustjacket, pp 160, 13 black and white plates, 5 text illustrations, reproducing Lindsay watercolours and drawings. London : The Bodley Head, 1962. Octavo, boards in illustrated dustjacket, pp. 287, price-clipped. 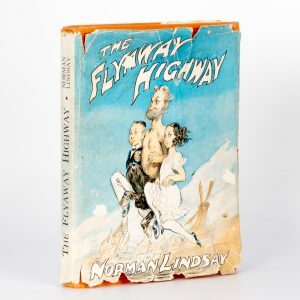 The third volume of autobiography from Jack Lindsay, founder of The Fanfrolico Press and son of Norman Lindsay. Adelaide : Art Gallery of South Australia, 2002. 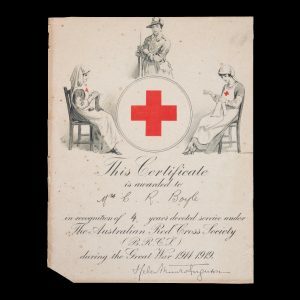 Pictorial trifold card, illustrated in black and white. 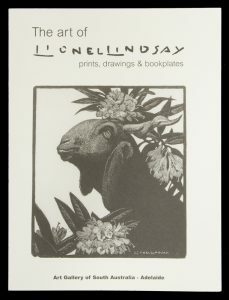 Brochure for the travelling exhibition of Lindsay’s works, with biographical information by Alisa Bunbury, Associate Curator of Prints, Drawings and Photographs. 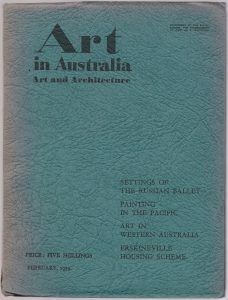 Melbourne: The Fine Art Society, 1926. Octavo, illustrated wrappers (foxed), 8pp., tipped-in black and white plate. Includes a two page appreciation of Lindsay’s work. Rare.